Mercedes-AMG has taken the covers off its new GT4 racer which could join the CAMS Australian GT Championship this year. Featuring an extended focus on safety, the car is aimed at both gentlemen racers as well as aspiring young drivers looking to make the step to GT3 racing and beyond. 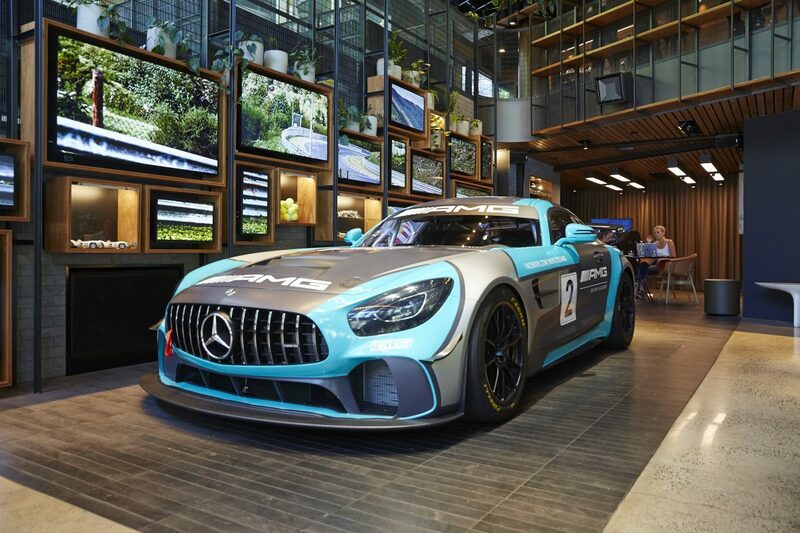 With the catchcry ‘Join the World’s Fastest Family’, the car has been launched at the Mercedes me store in Melbourne today and will be on show to the general public and AMG customers at next week’s Liqui-Moly Bathurst 12 Hour. It will then become a part of the AMG Driving Academy in Australia where potential customers will have the opportunity to try before they buy. The new Mercedes-AMG GT4 is powered by a twin-turbo 4.0 litre V8 engine with direct injection that will produce up to 375 kW (510 hp) and up to 600 Nm of torque with a top speed in excess of 250km/h. The car will retail in Australia for AU$320,000 and can be purchased directly from AMG in Germany. “This is a natural progression for most of our customers,” said Mercedes-AMG chief driving instructor Peter Hackett, who was on hand to unveil the car. “The GT4 is a perfect stepping stone for people who have explored the limits of high-performance road cars like the GT R and want more. “It provides an opportunity to learn about the components of the car like adjustable ABS and traction control as well as aerodynamics. Hackett spruiked that the new Mercedes-AMG is the safest GT car now available, a trait which is one of the highest priorities for the company’s customer base. “Most of our customers are businessmen with families and safety is a major priority,” he explained. “There is no safer GT car than the AMG GT4. “The safety system and cell is exactly the same as what we have in the GT3 car. “The driver is basically mounted in the car and the pedal box and steering wheel come back to them. Hackett believes the car will be attractive to serious circuit racers as well as weekend enthusiasts. “The car is a more accessible car and a more understanding car,” he added. “It’s more achievable and a logical step if you are an enthusiast or an avid driver; this a car you can buy and own. “You can take it to the track without a heap of support staff with you and an engineer looking at data on a laptop. You could take this car club sprinting if you wanted. Sales price: 198,850 euros (excluding sales taxes) / AU$316,000 approx. Speedcafe.com reserves the right to remove comments that are off-topic, abusive and ban users who do not follow the comment policy. Please read our Comment Policy before commenting. Some comments may require approval before being published which can take up to 48 hours. Try our daily email, The best way to get your news first, fast and free! Speedcafe.com has been established to provide a daily motorsport news service to the industry and fans in Australia and internationally. Subscribe to our daily newsletter, the best way to get your news first, fast, and free!